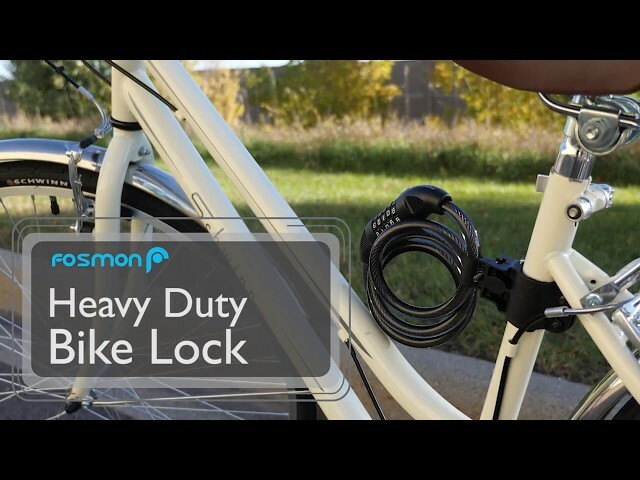 [KEEP YOUR BIKE SAFE AND SECURE WITH FOSMON'S 5 DIGIT COMBINATION BIKE LOCK] Fosmon's bike lock provides a strong and secure solution for keeping your bike safe when it is out of sight. The included bike mount will insure you have your lock with you every time you go out to the bike. [EXTREMELY STRONG AND DURABLE] The bike lock is made of a 12mm braided steel cable coated in PVC to help prevent corrosion and easy cutting. The hardened zinc alloy lock core and shackle are built to withstand punishment from the elements and most potential thieves. [100,000 COMBINATION POSSIBILITIES] With 100,000 possible combinations, the 5 digit cable lock is nearly impossible to break into. The lock offers you 90,000 more combinations than the typical 4 combination lock. [LOCK ANYTHING, ANYWHERE] The bike lock and its coil design provide the flexibility to lock not just your bike, but your yard equipment, exercise equipment and many other things. Fosmon's 5-Digit Bike Lock provides you keyless convenience in a strong package, giving you peace of mind that your bike will be safe and secure. The cable lock comes with an included bike mount, giving you the ability to always have it with you on every ride. It is the prefect bicycle accessory. The bicycle lock is made of a 6-foot coiled steel cable and a hardened zinc alloy lock core and latch and coated with a PVC and ABS shell. All of which adds up to an incredibly strong cable lock made to keep your bike safe when locked up. The 5 Digit Bike lock offers the possibility of 100,000 different combinations, giving you the closest thing to a sure bet that your lock combination will not be hacked, or lock broken into. NOTE: Please write down the combination when chosen, and store in a secure space. Can be used to lock anything, anywhere. It's not just a bike lock. Use Fosmon's 5 Digit cable lock to secure everything from yard equipment, to exercise equipment and more.